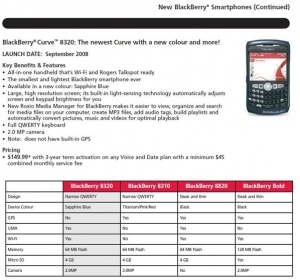 WiFi BlackBerry Curve 8320 coming to Rogers | BlackBerry Blast! Rogers is set to launch the BlackBerry Curve 8320 with WiFi. CrackBerry has unearthed some documents that show the details of the upcoming 8320. The new BlackBerry will hit Rogers in "Sapphire Blue" and will support Rogers' UMA/Talkspot service. You can get yours for $149 with a 3-year agreement on any voice plan. You'll need to have a data plan with a minimum $45 monthly fee.